Possibly the most important and best-known mural paintings in all of Paris are the three works by the Romantic artist Eugène Delacroix, completed in 1861. This mural program was to decorate the Chapel of the Holy Angels in the magnificent late baroque-style church of Saint-Sulpice. In this rather narrow space, Delacroix portrayed biblical subjects in two enormous wall paintings, each more than 23 feet high, and one nearly as large on the ceiling at more than 16 feet across. The murals were created not only with paint but with a mixture of pigments, linseed oil, and a small amount of wax. This combination was mixed together on the artist’s palette as he colored the surface. Careful preparation included many pencil and oil sketches, tests of complementary color relationships as well as technical preparations of the wall surface. Before he began, Delacroix had his assistants soak the walls with boiling oil because he feared the humidity might damage the works over time. Cleaned and conserved in 2015, the colors are vibrant as the oil gives a brilliant sheen to the wall surface, looking as if the colors were newly applied and the paint still wet. Far more details can be readily seen: for example, the bejeweled earrings worn by the embattled figure of Heliodorus (below). For the ceiling preparation, Delacroix’s assistants fastened canvas with an adhesive of white lead paint ground in oil (known as maroulflage). 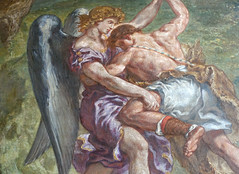 The excitement of these paintings is due in part to the artist’s decision to paint two subjects from the Jewish Bible (Old Testament), Jacob Wrestling with the Angel and Heliodorus Vanquished from the Temple, and one subject found in the New Testament’s Book of Revelation, Saint Michael Vanquishing the Demon (though, as explained below, Michael appears in both the Old and New Testaments). These visionary scenes of angels are far from traditional or familiar images of angels such as those in paintings of the Annunciation. 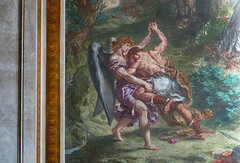 The unexpected trio of subjects—full of robust action and even violence—bewildered critics for a century or more, with two scenes with good battling evil (Saint Michael and Heliodorus), and one in which good (Jacob) is wrestling with greater Good (an angel — “one like God.”) However, if we examine scriptural sources in conjunction with the theology of divine intervention, the three subjects easily become unified and express a cohesive history: one that follows a chronological sequence of the Jewish people from the patriarchal period (from Abraham onward) to Christian salvific history at the end of time. Delacroix has often been characterized as a religious sceptic or an unbeliever. Yet many of his most important religious works were not commissions, but were motivated by his own inspiration. His now famous Journal writings show that he approached Catholic rites and biblical themes with sympathy and respect. Additionally, the angel subjects chosen for Saint Sulpice were inherently suited to his romantic style which is full of feeling expressed through vibrant colors, swift movements, dynamic line, and the power of the body. Taking each scene in chronological order, Jacob’s strenuous tussle with an angel symbolizes a pivotal moment in Israel’s history, marking the continuation of the covenant between God and his chosen people. The figure of Jacob, once a man of selfishness and a liar, is tested, humbled, and forgiven by the divine messenger. His encounter is transformative and he is made worthy of inheriting the status of patriarch of the Hebrew people. 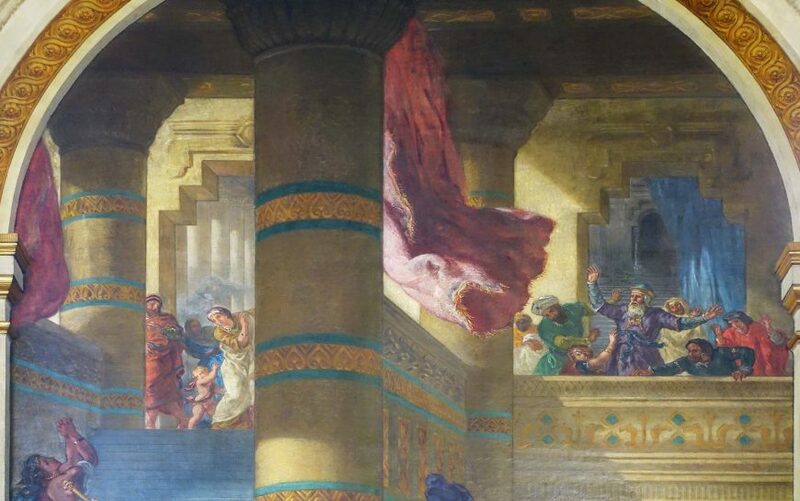 In the second scene, Heliodorus is sent by the King to rob the Jewish temple in Jerusalem of its supposed riches, but in response to the active prayers of the high priest Onais and the Jewish faithful, divine beings interrupt the sacrilege and swoop in to strike Heliodorus. In a richly decorated interior, a majestic looking rider on horseback rushes in from the left, the hoof of his gray dappled steed striking the prone figure of Heliodorus into a position of submission. At the same time, two figures float above, energetically whipping him with reeds. Finally, the third subject, Michael the archangel defeats Satan at the “End Time.” Michael is understood both as the guardian of the Israelites in the Old Testament Book of Daniel and also as the personification the Church triumphant in the New Testament. In each book of the Bible then, Michael represents a theology of salvation and resurrection. The archangel Michael unites the three stories in Delacroix’s program as three from the Old Testament about salvation history for the Israelites. Simultaneously, Michael in the New Testament Book of Revelation suggests the continuity between the Old and New Testaments as a continuous narration of this history. In each of the mural subjects there are distinct and quite specific references to verses in the Bible. At the time of Delacroix’s unveiling of the murals, at least three of his contemporaries recognized and wrote about this dual ascription of the figure of Michael the Archangel. One was the writer, Charles Baudelaire, in 1861. 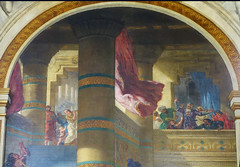 In 1868, Abbé Alphonse Hurel was the first clergyman to praise Delacroix’s mural program at Saint-Sulpice as a biblical history. Hurel challenged the critics of the program, believing that Delacroix’s paintings had broken with traditional nineteenth-century iconography and shaken up religious art. For a period of time, Delacroix’s romantic style of painting identified religious subject matter with modern art. Hurel claimed that the scenes of struggle (Jacob), of chastisement (Heliodorus), and of combat (Michael) were precisely the three subjects necessary to explain divine power, both for justice and for revenge in the battle of Good over Evil. Hurel reminded audiences that for superior talents, there was no need to sacrifice art for theology, nor theology for art. 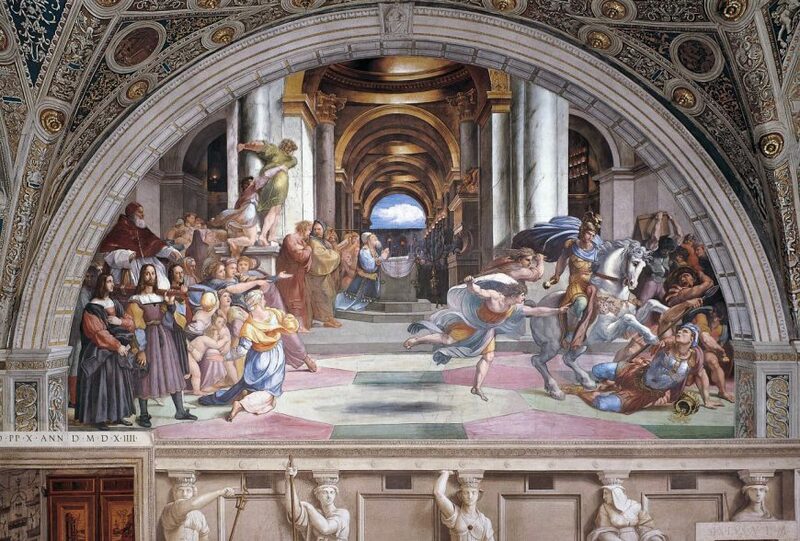 Two of the murals were inspired by the Renaissance artist Raphael’s Heliodorus Driven from the Temple and Archangel Michael Vanquishing the Demon. The model for the third subject remained unknown for a long time. Yet, it, too, is inspired by Raphael’s work. The figure of Jacob is found in a number of Raphael’s frescoes in the Vatican loggia that were later reproduced as engravings. Delacroix studied engravings of Raphael paintings in books located at the national library in Paris. Delacroix could read English texts and these designs by Raphael had been published in both French and English since the 1830s. Delacroix made many pencil or ink sketches of these poses by Raphael, combining them to create the wrestling figure of Jacob. Moreover, Delacroix had published an essay about Raphael years earlier and knew the work of this esteemed artist. Strained poses and rapid movements characterize the action-oriented figures that Delacroix admired and copied from Raphael’s designs through the engravings made by Marcantonio Raimondi. In Heliodorus Vanquished from the Temple, Delacroix represents energetic forms with suppleness and grace and expressions of calm on the part of the divine intervenors. Delacroix found sources of inspiration for the murals at St. Sulpice from both poetry and prose, and he recorded some of these sources in his Journal. Specifically, he mentions the inspiration of his contemporary Alphonse Lamartine. One of Lamartine’s poem meditations, Jacob Wrestling with the Angel, offered verses from which Delacroix imaginatively translated the figures of the poem into pictorial form: “suddenly one rushes the other, the threatening arms, their legs press, their knees entwined.” Many of Delacroix’s preliminary drawings for this painting show clearly how the poses and forms correspond to the verses. In this mural program, one scene is linked to another in a sequence that unifies the cycle of salvation history. The mural program recalls the narrative of the encounter between God, his angels, and his people, and their experience of being rescued by him. Additional reviews appeared in the journal Le Triboulet (1861) and the magazine La Revue chrétienne (1862). Hurel, L’Art religieux contemporaine (Paris: Didier, 1869), p. 372. 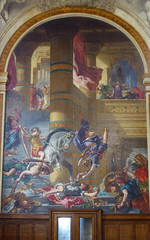 Joyce C. Polistena, The Religious Paintings of Eugène Delacroix, (Lewiston: Mellen Press, 2008) and “Nouvelles sources pour le cycle des peintures murales de Delacroix à Saint-Sulpice” in Bulletin de la Société des Amis du musée de Delacroix, 2009, no. 7, pages 25-38. Entry from August 29, 1857 in Eugène Delacroix, Journal 1822-1863 (Paris: Librairie Plon, Collections Les Mémorables, 1996), page 676. There are several English language editions of the Journal. See The Journal of Eugene Delacroix, reprint (London: Phaidon, 2004). Cite this page as: Dr. Joyce C. Polistena, "Eugène Delacroix, Murals in the Chapel of The Holy Angels, Saint-Sulpice," in Smarthistory, July 9, 2018, accessed April 20, 2019, https://smarthistory.org/delacroix-sulpice/.